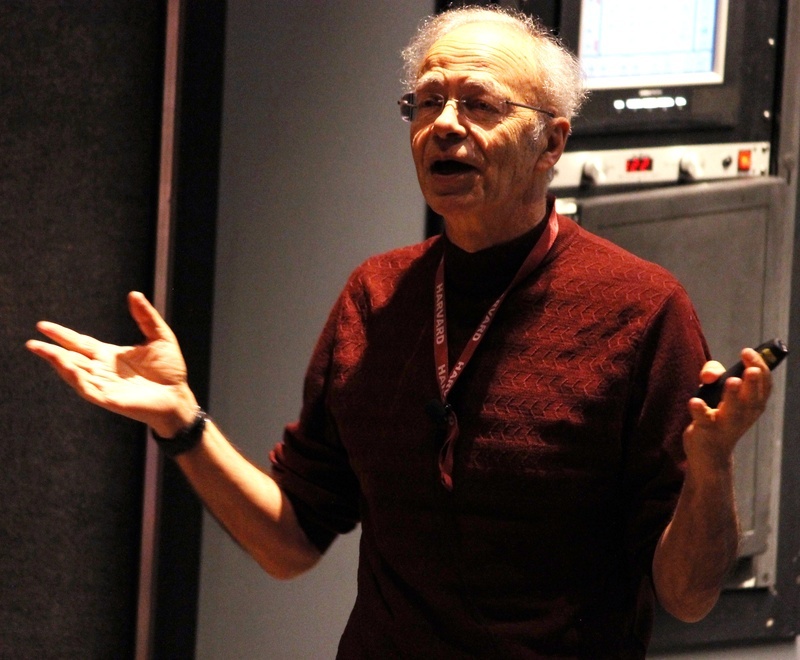 Peter Singer, Professor of Bioethics at Princeton University, speaks about doing as much we can at the Effective Altruism talk in the Science Center on Friday. Moral philosopher and Princeton professor Peter Singer described what he called a “momentous revolution in thinking” regarding animal welfare during a talk in the Ames Courtroom at the Harvard Law School on Friday. During the event, entitled “Ethics and Animals: Where are We Now,” Singer described the economically-driven processes of factory farming and mass-fishing and the laws that the European Union and United Kingdom have implemented in the past decade to strictly regulate the treatment of animals during those practices. But, Singer cautioned, while the world has come a long way, outlooks surrounding the ethics and the treatment of animals have not been pushed as far as he thinks they could. Singer cited the Bible, in which God grants the humans dominion over the animals, as the first documentation of humanity’s obligation to animals. He said that he thinks “dominion” has come to be interpreted as the right “to do as we will,” rather than as responsible stewardship. Bentham’s ideology has also been applied to discussions about slaves, infants, and those with cognitive disabilities. The case for animal consciousness and the need to acknowledge their interests, Singer said, is evidenced by the similarities between animals and humans—anatomically, physiologically, and behaviorally. He also pointed to the shared evolutionary history between the two. “We are animals,” Singer said, citing Darwin’s theory of evolution. Singer, a professor of bioethics at Princeton and the University of Melbourne, is the author of the controversial book Animal Liberation, which asserts that animals’ interests should be given equal weight to those of humans. The book drew criticism upon its release in 1975. Friday’s talk was part of a series sponsored by the Petrie-Flom Center for Health Law Policy, Biotechnology, and Bioethics at the Law School. Singer also spoke later in the day in the Science Center about effective altruism—a utilitarian stance on how best to affect change in the world. “If God were a utilitarian, Singer would be his patron saint,” Law School professor and Petrie-Flom Center co-director Glenn Cohen said in his introduction.